1st Gear: Talks between the UAW and Detroit's automakers begin today, and despite the industry's good times there's a high amount of antagonism on each side. UAW President Bob King told Reuters that the union will not accept cuts in wages and benefits, given how much it sacrificed during GM and Chrysler's bankruptcy and since all three companies are now profitable and giving their top executives pay increases. Meanwhile, the automakers themselves maintain their costs are still a few dollars per working hour higher than at foreign automakers' factories in the United States, and want deeper cuts in healthcare costs. 2nd Gear: Mercedes-Benz unveiled its fastest-ever C-Class vehicle today, the C63 AMG Coupe Black Series, which in true Germanic humor was only photographed in red for its debut. Sporting a 6.3-liter V8 massaged to 510hp in its U.S. spec, the C63 can blitz to 60 mph in 4.2 seconds, with the power routed through an upgraded 7-speed automatic. The suspension, brakes and tires all receive some AMG go-fast magic, and Mercedes will even offer a track package that includes carbon-fiber aerodynamic parts and active rear-transmission cooling. One more piece of standard equipment: a fire extinguisher, apparently for dousing any Ferraris that might get beaten in a street race. 3rd Gear: Speaking of Mercedes, Daimler will spend $2 billion over the next few years upgrading its Mercedes factory in Alabama to handle more models — including a version of the C-Class car. Per Automotive News, the plant will expand to build not just M-Class and GL-Class SUVs, but C-Class cars in 2014 and something called an MLC, a "coupelike" variant of the M-Class meant to target the BMW X6. Good thing Mercedes is chasing that booming market, seeing how BMW's sold 2,747 X6s in the U.S. through June. 4th Gear: Having proved its mettle in Formula 1 racing and other motorsports in recent years, Red Bull Racing now wants to build road cars through its deal with Nissan and its Infiniti brand. Red Bull boss Christian Horner tells Autocar that "Red Bull used to be known only as an energy drink company, but now it is recognised as an engineering team. It's a natural evolution for us to get involved in road car engineering." It's not clear which Nissan or Infiniti might receive a pair of wings — or if those wings would be strong enough to fly it across the Atlantic. 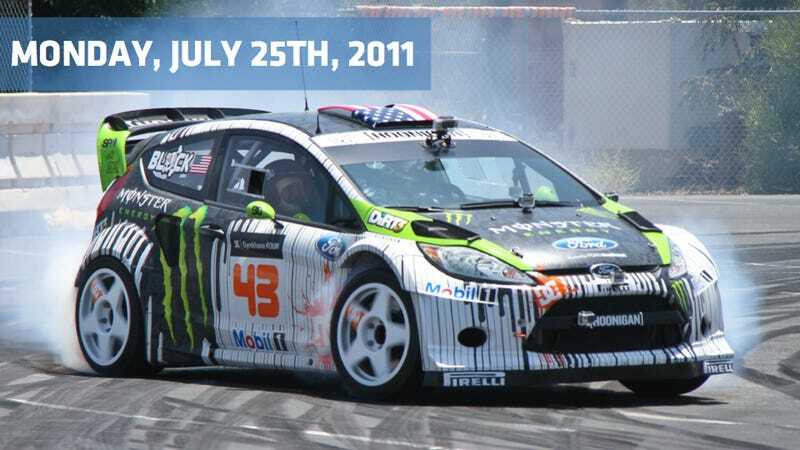 5th Gear:Ken Block's new "hybrid" vehicle isn't an electrified Fiesta rally car, but rather a "Hybrid Function Hoon Vehicle" — one car that can be adapted to drive in Rally America races, rallycross events and Block's own Gymkhana sacrifice of vulcanized rubber to the tire gods. The combo required replacing the 1.6-liter WRC engine with a 2-liter four-cylinder good for 600 hp and 665 ft-lb of torque; for rally events, its cooling system and turbo is swapped out and a co-driver seat added. Each event requires its own tires, suspension and gearbox setup, changes that can take up to a day. 6th Gear:Remember the days when your parents took you or your siblings on lengthy car rides to summer camp, where you could bond, fight or get car sick? Good for you, poors, but America's wealthy don't have time to squander on freeway backups and endless rounds of "what is that smell and who did it?" According to the New York Times, many are now ferrying their progeny to summer camp via private jet — because nothing prepares you for a week in the wilderness like hopping on a Gulfstream. On this day in 1941, Henry Ford writes a letter to the Indian nationalist leader Mohandas Karamchand Gandhi. The letter effusively praises Gandhi and his campaign of civil disobedience aimed at forcing the British colonial government out of India.